PRICE: Ummm about £2.70 ish I think. Or £3.10? I’m just plucking numbers out of the air here. It’s cheap, basically. FILLING: A skewer of chicken flavoured with a mild satay, cucumber strips, pickled daikon and carrot, coriander, sweet chilli sauce, fresh chilli. 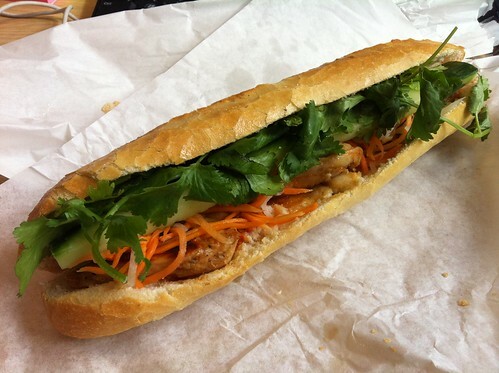 PROS: Camberwell is basically a sandwich wasteland so Viet Cafe must be making an absolute killing. This is by no means the best banh mi in the world but it stands out a mile in an area packing only a Subway (what IS that smell that comes from Subway?) and numerous crappy cafes. Yes I enjoyed Rock Steady Eddie’s recently but seriously, there’s a time and a place, sickos! I’m constantly amazed that the chicken satay banh mi is so much better than all the pork banh mi and, especially and, it’s better than the banh mi special which contains all the types of pork at once. ME CONFUSE. Anyway, it’s the best so I never order anything else. It’s also good and punchy, just the way a banh mi should be. I like the sweet chilli sauce filth factor, which they then ramp up with bits of fresh chilli so by the end I’ve really worked up a proper sniffle. Banh mi never have enough chilli in general, I find, so mad props to Viet Cafe in that respect.